Anthony Caro / John Golding: In Conversation, was published to accompany an exhibition of the same name, exploring the personal and professional bonds between two of Britain’s greatest abstract artists. 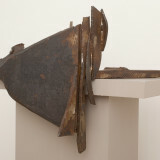 Both Anthony Caro (1924- 2013) and John Golding (1929-2012) reached creative maturity in the 1970s, a prodigious decade when some of their most accomplished work was produced. 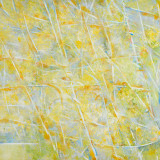 Having created work representing the human form, both adopted an abstract manner. They balanced their new forms of expression against an enduring fascination with the body. Astonishing originality was produced: considered together, Caro and Golding emerge as two major figures of twentieth century abstraction. As close contemporaries and friends, they both absorbed the influence of Abstract Expressionism and translated it into a British context. Both artists may consequently be regarded as pioneers in the development of twentieth-century art: Caro through his de-plinthed, painted, welded and bolted sculpture; and Golding, through his seminal writings on Cubism and Abstract Expressionism, but also by his impressive and diverse oeuvre of hard-edged, colour field paintings.